Insight Guides: all you need to inspire every step of your journey. An in-depth book, now with free app and eBook. 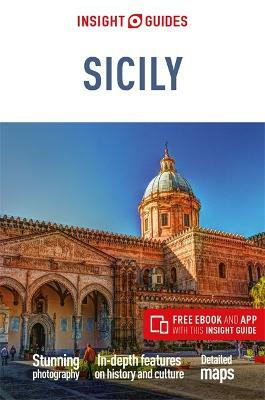 From deciding when to go, to choosing what to see when you arrive, this is all you need to plan your trip and experience the best of Sicily, with in-depth insider in... read full description below. Insight Guides: all you need to inspire every step of your journey. An in-depth book, now with free app and eBook. From deciding when to go, to choosing what to see when you arrive, this is all you need to plan your trip and experience the best of Sicily, with in-depth insider information on must-see, top attractions like buzzing Palermo, Mount Etna and Agrigento's Valley of the Temples. * Insight Guide Sicily is ideal for travellers seeking immersive cultural experiences, from exploring Palermo's Arab-Norman heart, to discovering the exquisite and hiking-friendly Zingaro nature reserve * In-depth on history and culture: enjoy special features on festivals, architecture and Sicily in the movies, all written by local experts * Includes innovative, unique extras to keep you up-to-date when you're on the move - this guide comes with a free eBook, and an app that highlights top attractions and regional information and is regularly updated with new hotel, bar, restaurant, shop and local event listings * Invaluable maps, travel tips and practical information ensure effortless planning, and encourage venturing off the beaten track * Inspirational colour photography throughout - Insight Guides is a pioneer of full-colour guide books * Inventive design makes for an engaging, easy reading experience About Insight Guides: Insight Guides is a pioneer of full-colour guide books, with almost 50 years' experience of publishing high-quality, visual travel guides with user-friendly, modern design. We produce around 400 full-colour print guide books and maps, as well as phrase books, picture-packed eBooks and apps to meet different travellers' needs. Insight Guides' unique combination of beautiful travel photography and focus on history and culture create a unique visual reference and planning tool to inspire your next adventure.